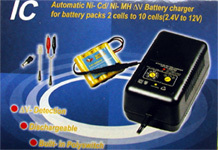 Hitech Wall Charger 7.2-12V NiCad and NiMH charges both, and quickly. This baby charges 2-10 cells up to 12volts, a discharger, and a miniplug adapter. Large Nicad Battery for all day fun! if you use ni-cad type batteries then you know the frustration of deciding to just charge the battery and damage it, dry-fire and cause damage/wear on the internals, or you could shoot bbs and waste them... but with a discharger all of this is gone just simply discharge your battery after a game. this product also has a smart cut off, so you dont need to worry about unplugging any type of battery that you might be charging. do your self a favor and just buy this already!